NASHVILLE, TN — If you look for Edgehill on Google Maps you won’t find it. The late British writer Jessica Mitford said something similar about Oakland, the city across the bay from San Francisco. “There is no ‘there’ there,” she said. Many residents of Edgehill feel that way about their neighborhood. 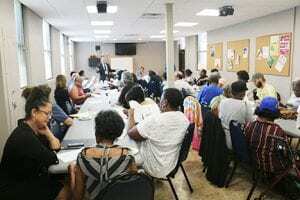 “You can build what you want but after it’s built people won’t stay because they don’t feel connected to the larger community,” said Pearl Sims, a Metro Planning Commissioner. Jeff Hall talks with Edgehill Residents about conducting a survey to help design the new mixed-income development. Sims was with a group of about thirty Edgehill residents and she was talking to Jeff Hall, MDHA Executive Program Manager, who was assessing the needs of low-income residents who live in 380 units of the Edgehill public housing complex. The two-story brick projects are 67 years old with bad plumbing and shot wiring. MDHA is going to replace them with a mixed income development. 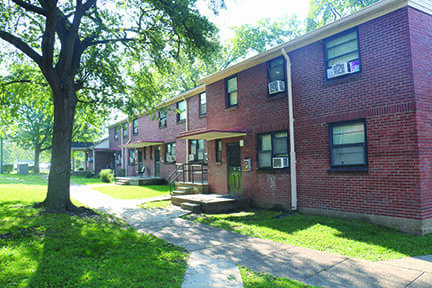 All 20 of MDHA”s public housing projects will be converted to the Rental Assistance Demonstration program and Edgehill is one of seven MDHA projects slated for demolition. How many stories, what kind of units, and made with what materials are things Hall is trying to figure out. He is in charge of a resident needs assessment and he has an 80-question survey he wants residents to fill out. “One of the primary faults I find in public housing as it is right now is that it isolates the rest of the community like there is a physical wall around it so we don’t get to build friends and neighbors and lots of us feel very isolated,” Sims said. She said the survey needs to ask residents about feeling connected to the neighborhood or MDHA will not understand how to create more than just floor plans. “Where is the actual design for the community itself?” Sims asked. The Edgehill projects are on the corner of 12th Ave. South and Edgehill Ave, both are wide and busy streets. There are no supermarkets, retail stories, or restaurants nearby. It doesn’t just feel like a lonely urban desert. It looks like one, too. the Melrose District lies to the South. It’s a longish rectangle about 1.5 square miles in size. Parts 12th Avenue South feel like an urban desert. Edgehill has been sliced by I-65 and diced by Belmont and Vanderbilt that over time bought and built on land where historic old properties once housed many black families. Urban pioneers have redeveloped many homes once owned by African Americans in East Nashville, 12 South, Melrose, and Wedgewood-Houston. It is not news that African Americans are being displaced from their old neighborhoods. But the residents of Edgehill Apartments are digging in. There are four committees that meet regularly to imagine, discuss, and plan the new Edgehill development. How much common space, where will the playground be, will there be retail outlets? What social services will be available? What about transportation and jobs? 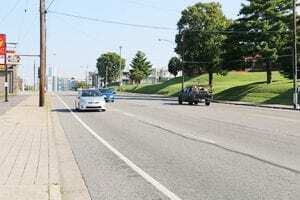 “We can talk about some common places where it’s very intentional about residents connecting. We are going to have events to create opportunities to come together, and you will have an opportunity to be involved in that,” said Cam House, a program coordinator with Salama Urban Ministries. MDHA is bucking the trend in Nashville to build new housing faster than you can shake a stick at but that few can afford. MDHA finished 70 new subsidized one-bedrooms at Cayce Homes in August. It will put in 94 new units of mixed income apartments next and may build as many as 2,390 total units. A lot depends on the construction costs, the available acreage, and financing. “Depending upon what you want to build, the more expensive it is the more you have to account for debt service,” Hall told residents. Unlike much of what passes for affordable housing in Nashville, MDHA’s new mixed income apartments really are going to be affordable. Hall said there has to be one for one replacement of low-income units in MDHA’s current properties but how many work force and market rate units there will be in the new Edgehill will be decided after a market survey is done. Hall said an architect will probably be hired by mid-October. MDHA has hired consultants to help plan the new development. “One of the biggest challenges to mixed incomes is putting people with different backgrounds, different races and family situations together,” said Ben Tram. Tram fears what happened with workforce housing in Chicago could happen here. An infamous housing project called Cabrini-Green on Chicago’s North Side became the poster child for everything that’s wrong with public housing in the U.S. High crime and poverty and deplorable living conditions are a toxic mix. The human costs are akin to living in a war zone. But it didn’t start out that way. The first homes were built in the 1940s. 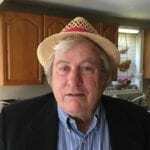 They were integrated, 75 percent white, mostly Italians, and 25 percent black. Many people held factory jobs but after WW II thousands of workers were laid off. Disinvestment, unemployment, white flight, and drug gangs just made things worse. In 2011, the last Cabrini-Green high-rise building was torn down. In its place a new mixed-income 790-unit development is being built with private and public money. The Chicago Housing Authority has a $1.5 billion plan to replace high-rise public housing with a mix of traditional public housing and new mixed- income developments. It is working. Crime is way down. Market rate housing surrounds the old Cabrini-Green site but there are mixed-income condos for sale nearby. Mayor Megan Barry is trying to incentivize private developers to build similar projects in Nashville. “I’m impressed. I think it could work,” said Agnes Scott. What she worries about is whether the new mix of residents will be good neighbors and become friends. She said that the Envision Edgehill planning is resident-led but not enough of them are involved. “We need to come together and come up with a plan to bring people together so the new residents and the public housing residents can talk,” Scott said.